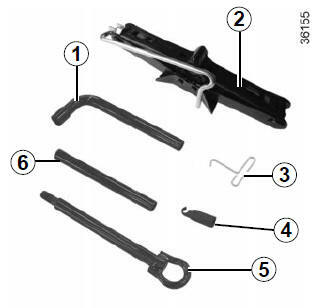 The tools included in the tool kit depend on the vehicle. 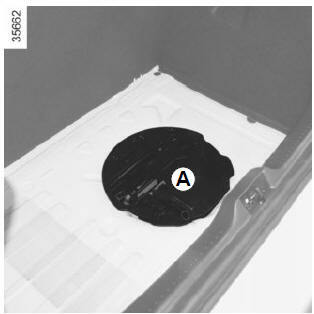 Tool kit A is located in the tray under the luggage compartment carpet. Lift the cover and remove it. Fold it correctly before refitting it in its housing (ensure that the wheelbrace is correctly positioned). This tool is used to remove the wheel trims. To finish loosening or starting to tighten the wheel bolts. Please see “Towing: breakdown recovery” in Section 5. This tightens or releases the tow eye 5. Do not leave the tools unsecured inside the vehicle as they may come loose under braking. After use, check that all the tools are correctly clipped into the tool kit, then position it correctly in its housing: there is a risk of injury. If wheel bolts are supplied in the tool kit, only use these bolts for the emergency spare wheel: refer to the label affixed to the emergency spare wheel. The jack is designed for wheel changing purposes only. Under no circumstances should it be used for carrying out repairs underneath the vehicle or to gain access to the underside of the vehicle.